The essay describes the development of this system research unity: its publishing results, main topics, different solutions and open questions. Moreover, principal subjects are highlighted that are deepened according to different points of view, such as the refusal of reductionist epistemology in favour of a methodological pluralism; the difference between systemic and holistic approach; the acceptance of finalism in the scientific explanation; the importance of emergent properties as systemic properties; the structural flexibility and incompleteness of systems and their knowledge. The notion of equilibrium is polysemic and its most general meaning is that of a state in which opposite forces mutually neutralize themselves. Its most satisfactory treatment can be attained by resorting to the conceptual and technical tools of general system theory such as they are applied, for instance, in physics, chemistry and biology. In this last science equilibrium receives the deeper meaning of homeostasis from which, by introducing the notion of information, one attains the domain of cybernetics and its related models. In such a way extensions of the notion of equilibrium can be obtained, e.g., to psychology, historiography, political theory, economics. In these domains equilibrium can be used in order to study dynamically the evolution of complex systems and this is precisely the reason for expressing it in terms of general system theory. Robustness, the property by which living systems maintain a function despite external and internal perturbations, is currently one of the most powerful cross-disciplinary concepts relating both biological and artificial systems on the basis of their common organisational principles. In this paper we argue that robustness can be also considered an emergent property that plays a pivotal role in fostering the integration of functional levels in the organismal system. This perspective widens the concept of biological regulation in order to better account for the explanatory relevance of robustness in biomedical sciences. Paradigmatic for this discussion is the biology of cancer. The investigation of the unorganized heterogeneity exhibited by cancer cells offers, in fact, an insight into the conditions for the organized dynamic functional heterogeneity that underlies the robustness of healthy organisms. In its integrative capacity, robustness can be therefore better characterized in the framework of a relational ontology of levels, whose dynamics of co-determination involves different types of dynamic principles and ensures the integration of functional macrostates at different scales. The unitary character of nature, that makes it possible a science based on shared basic principles, was considered to be a consequence of the fact all the natural entities are made of the same ‘matter’ obeying to the same fundamental laws. In the dawn of the third millennium, the perspective drastically changes: the unity of nature does not descend anymore from the same basic bricks, but from the presence of ‘common organization principles’ shared by all the systems constituted by parts each other related by functional and structural relationships. Fundamental laws do not live anymore in the most microscopic layer but where the most relevant relationships among different scales of observation can be found. Biology is the science most affected by this new approach pushing us to a re-thinking of our way of doing science that must re-start from the considerations of forms as the basic scientific objects. This contribution is based on the circularity pointed out by the following sentences: «It is for their physics that metaphysics get old» (E. Gilson) and «It is through physics that we go back to metaphysics today» (J. Daniélou). Two paths are juxtaposed: the first is the ontological one, that from the Pythagorean identification of being and number brought to overcome the identification of being and the intelligible dimension, typical of Greek metaphysics, by virtue of the apophatic approach formulated in the framework of 4th century Trinitarian thought; the second path starts with Pythagorean doctrine again, but on the scientific side gets to overcome 18th century determinism through chaos physics and quantum mechanics. These two paths seem to join each other in the development of an epistemology fitting for the work on objects which are relations, as the comparison of some of Galileo’s thoughts and Cappadocian theology, most of all Gregory’s of Nyssa doctrine. The positive answer to the question posed by the title in based on the ontological value that the Trinitarian doctrine assigns to relation itself and to the epistemological effects that such an identification implies for relation also in the field of physics. The aim of this paper is to consider the ontological implications of the Systemics. Having concluded that Systemics cannot be relevant just for the epistemic side but also for the ontological one, the individual organization, principle of unity and persistence in the becoming, turns out to be central to the systemic ontology. This organization allows the system to obtain emerging properties which individual parts of the system do not hold in isolation. Due to its individuality and uniqueness, the organization cannot be reduced to a universal model or to general laws. Furthermore, it is asserted that essentialism, reductionism and determinism, constituents of meccanicism, are incompatible with this ontology. Finally, some evidences about the existence of systems in sciences and arts are presented. Philosophy of mind typically studies mind and brain in order to understand their relationships. There are many assumptions commonly accepted without any critical survey by most philosophers of mind that severely limit the possibility of finding a solution to the gap between mind and brain, such as: reductionism, physicalism, materialism, analytical method, mechanicism. With the help of new perspectives coming also from biology and the neurosciences, I suggest to introduce the systemic approach to better understand what sort of being the humans are and how mind and brain should be thought in order to solve the problem of their relationships. The discovery of the Higgs particle and the experimental confirmation of the Higgs mechanism are discussed in the conceptual frame of the elementary particle physics of the past century and of the first decades of the present one. Some of the physical details show that the vision of the world made of elementary constituents, free from any interaction with their environment appears to be the naїve vision of the world, according to Cassirer definition. The landscape emerging from the Standard Model instead fits well with the systemic view which fully incorporates the physics of the open systems and quantum field theory. Finally, the arrow of time, typical of the open system physics, is briefly discussed. Preceded by the edition of quaestio XXV and by the analysis of Gregory of Rimini’s and John of Mirecourt’s texts, contained in the last two numbers of the «Rivista», can now appear – sufficiently prepared – Pierre Ceffons’ dedicated study. Active in years immediately post Mirecourt’s condemnation (1347), Ceffons deeply gleans into Mirecourt’s texts, and, staging a complex and refined route made up of finctiones and conclusions ymaginatae, in which progressively show up a lot of Mirecourt’s thesis – without explicit ascription – Ceffons brings himself nearer and nearer to his ‘real’ target: Gregory of Rimini and the significabile complexe’s doctrine, attacked on its weaker side, the ontological consistency of any significabile complexe, refused due to its inadmissible eternal entity. In the present essay I will try to give an interpretation of Spinozistic adequate knowledge based on «ontological holism». With this expression I mean that, according to the Ethics, each thing has a total and real existence only in God, together with its causes and its effects, and has a partial existence isolated or abstracted from them, e.g. in each of its affection. The adequate idea corresponds to the whole reality of the thing, while the inadequate idea corresponds to its partial reality. I start by analysing the main aporia commentators attribute to adequate knowledge. It should be auto-determined, but all the finite things are hetero-determined. Once having solved the aporia, I proceed to comment on EIIP38 and EIIP39. The core of the proofs becomes the presence of properties which are equally in the partial and in the whole reality of a thing. According to EIIP7C, the idea of the properties has to be also equally in the adequate idea and in the inadequate idea of the thing and therefore this idea will be always adequate. To end, I give a definition of ‘adequation’. The opening sentence of § 16 in the Transcendental Deduction of the Critique of Pure Reason states that «das Ich denke, muß alle meine Vorstellungen begleiten können» (KrV, B 131). It can be regarded as one of the most significant statements in the history of philosophy because it is concerned with the unity of consciousness, i.e. the semantic relationship between consciousness and subjectivity, and the possibility of experience. The I think consists in the subjective self-consciousness manifesting itself within the categorical synthesis. Thus, by analyzing the forms of this manifestation, we should understand how a representation can be recognized by the subject as its own, and be known by it. At the same time we need to distinguish those representations, which do not belong to the subject, because it cannot accompany them. Firstly, this paper analyses the Kantian concept of experience and its main components. Particular attention is paid to the role played by imagination within the process of knowledge, insofar as imagination is placed between understanding and sensibility. This lets us appreciate the relevance of time, as the form of the inner sense. Indeed, by means of time, the transcendental apperception expresses its synthetic function in the categorical synthesis of experience, in accordance with the rules of judgement. Finally we show the effectiveness of transcendental schematism, in order to grasp the relationship that connects I think, imagination and knowledge. This paper deals with 20th century interpretations of Aristotle’s modal syllogistic. The aim of the paper is to present the various interpretations in a schematic way so that similar interpretations may be grouped together in order to be evaluated and assessed. The purpose of this article is to provide a reconstruction of the theoretical and historical context of the evolution of the theory of regressus demonstrativus as it was treated around 1589. Approximately in this date Galilei writes the ms. 27 and begins his teaching at the University of Pisa where scientific research is closely linked to Aristotle’s Posterior Analytics. 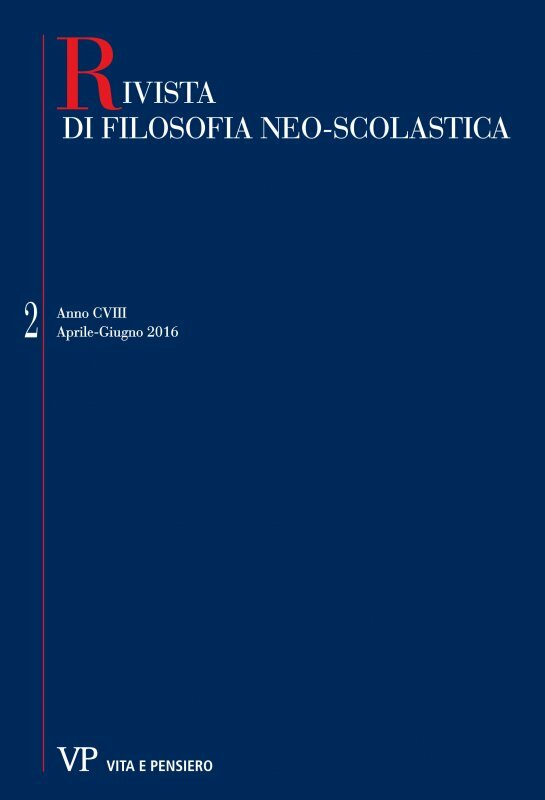 The theory of regressus demonstrativus is very important in the logical developments of Aristotelian tradition and is a fundamental methodological tool subject of university teaching in the late fourteenth and early seventeenth century. It finds its highest theorizing within the University of Padua in the fifteenth and sixteenth centuries and, since that time, constitutes an essential argument of epistemological discussion in all European universities. The quaestio An detur regressus demonstrativus is the culmination of the speculation contained in ms. 27 which is the first Galileo’s work of logical and methodological nature: of this is provided the Latin text and the first translation into Italian.